What I can do about this problem and more important, how we can prevent this? My topic was rejected, then it was copied with the same code and my image and approved. Obviously, the system must be improved. Something that was rejected, the same was subsequently approved. Someone just copied all my work, included my code and my image that I still have on my computer and posted them like is his own example. 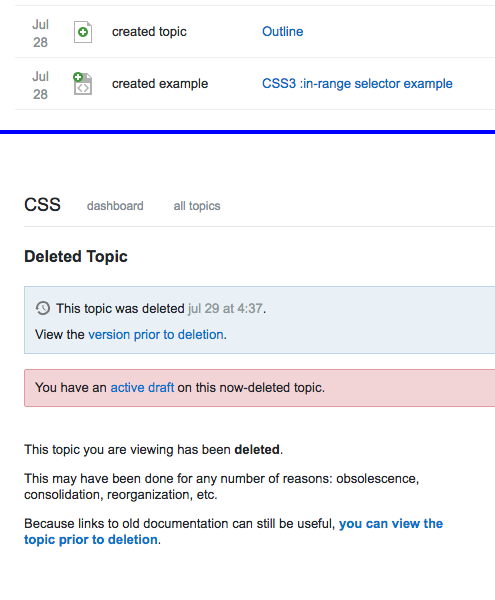 I don't want to contribute to the Documentation if someone can just reject my topic and then post them. UPDATE: I accepted the answer because it seems the only action possible right now. I made a request until to post the question here, but I hoped it is a solution to prevent problems like mine. That example was deleted and I submitted my example again. I really hope this was an isolated incident. I blame this mostly on the system not having a defined workflow for cases where someone wants to make a small change prior to or while approving something. The default for this should always be to approve good content, and then go back and make whatever tweaks you feel it needs. Rejecting and then posting again certainly isn't the manner that we envisioned anyone going about it, I think it's rather rare that someone would consider that the best option, but it still shows that the review system is lackluster. Kevin and Jarrod are working on just putting a full-blown review-style interface on this, which should offer a much less complicated and obvious workflow for those instances. While that's happening, just (generally for anyone reading) approve good content by default, then make additional edits as necessary. I'm new here. So don't get me wrong - but can't you just flag it? Flag it with another reason than mentioned in the list, explain what happened. There is no fool-proof way to detect this happening so this is your best bet. 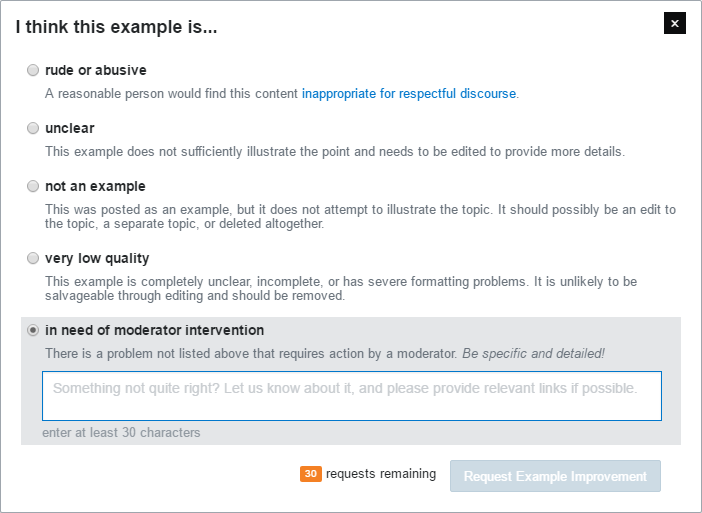 If wrong action were to be taken then you can post about it and question the action taken along with a proposal or ask for proposals to help prevent wrong action being taken. But until then, flag it? Not the answer you're looking for? Browse other questions tagged discussion support feature-request documentation documentation-drafts . What is currently being done to keep plagiarists at bay? Draft approved, but does not show in main page? RE: 1 reject + 1 approval = approval?